Governor Hogan's administration is turning its back on Maryland students who are currently required to use school-issued digital devices with absolutely no medical oversight, when every day, more research shows that daily use of digital devices will harm children's eyes and growing bodies, and increase the likelihood they will experience serious health issues such as obesity, depression, addiction and diabetes. Letters have been written to his former Chief of Staff and to Secretary Schrader, which were simply patronized and ignored. So the following was written in a letter to the governor in May. This effort is supported statewide, as evidenced by the large number of delegates who co-sponsored a bill in the last General Assembly session. The documented health risks facing Maryland students who are required to use digital devices in school every day are serious; many children will be harmed, needlessly. Any online search will reveal how well known these risks are in the medical community; the research dates back to the 1980s. For instance, the laptops distributed to Maryland students were never designed to be workstations, as pointed out by the manufacturers themselves who specifically state the devices can cause serious injury. The schools are completely ignoring the health warnings of the manufacturers. OSHA has protected office workers from many of the same health risks since the 1989, but our growing children - who are more vulnerable to permanent damage - have no safety protections whatsoever. 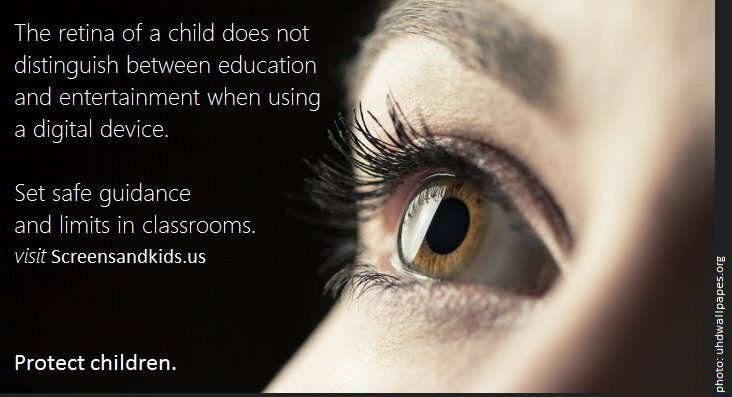 Please take action at your soonest opportunity to ensure that Maryland students will have classroom safety in place when they begin school next year. This effort has the full support of the Maryland State Medical Society (MedChi) as well as the American Academy of Pediatrics Maryland Chapter and Prevent Blindness. National leaders in child health issues follow my Twitter account, as do reporters both locally and for the New York Times. The issue has growing public support, thanks to shows such as Good Morning, America and 20/20 which have run segments as recently as last week regarding digital device health risks to children, teens and adults. Details, letters of support, and extensive medical research can all be found on my blog: www.screensandkids.us. You'll also find television and radio interviews, and links to my Washington Post and Baltimore Sun Op Eds on the site, along with testimony from recent General Assembly hearings. My most recent article appeared in Psychology Today just last week. Our children are legally entitled to a safe classroom, and right now they don't have one. They are in danger, specifically because of the unregulated use of hazardous equipment, required by their schools. These are known, documented health risks that are avoidable, and they are not being avoided. There are many people who are now considering legal action, as a result. I don't believe for a moment that you would allow this situation to continue if you were personally familiar with the details, Governor Hogan, which is why I am appealing to you directly. I sincerely hope I'm correct in this perspective and that you'll take swift action to correct it. You have known firsthand the sorrow of seeing children who are sick, and the price paid by the entire family as a result. Many diseases cannot be avoided; but harm from school equipment can be. A Public Information Act (PIA) request for staff emails about the legislation and the disappearance of a School Health web page revealed the worst kind of indifference among the governor's top people, including Health Secretary Schrader's top staff. Doctors in the Health Department did nothing but desperately attempt to escape responsibility. The Office of School Health director -- a nationally known pediatrician -- suggests in one email that the documented health risks posed by the schools' digital devices are a curricular issue. Not her problem. That's like saying uncapped bottles of bleach stored in a Kindergarten classroom is a housekeeping issue. At least one Democratic gubernatorial rival has enthusiastically stated support for classroom screen safety guidelines to be crafted by the Maryland Department of Health. Let's hope others will too - especially those on the decisive General Assembly committees - since Governor Hogan appears disinterested in protecting our children. Let's also hope that legal actions, such as injunctions, won't be necessary to keep Maryland students protected from avoidable harm in their own classrooms. Our kids should not have to suffer before anything is done.